Information on AudioBooks - What is an AudioBook? Veuve Clicquot champagne epitomizes glamour, style, and luxury. But who was this young widow-the Veuve Clicquot-whose champagne sparkled at the courts of France, Britain, and Russia, and how did she rise to celebrity and fortune?In The Widow Clicquot, Tilar J. Mazzeo brings to life for the first time the fascinating woman behind the iconic yellow label: Barbe-Nicole Clicquot Ponsardin. A young witness to the dramatic events of the French Revolution and a new widow during the chaotic years of the Napoleonic Wars, Barbe-Nicole defied convention by assuming-after her husband's death-the reins of the fledgling wine business they had nurtured. Steering the company through dizzying political and financial reversals, she became one of the world's first great businesswomen and one of the richest women of her time.Although the Widow Clicquot is still a legend in her native France, her story has never been told in all its richness-until now. 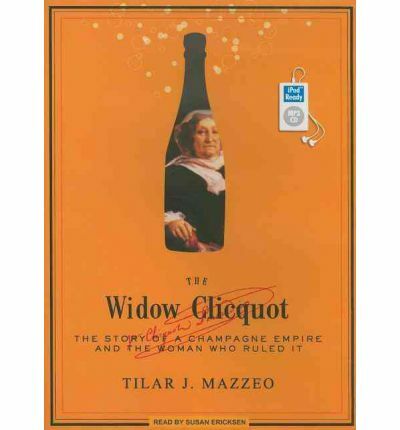 Painstakingly researched and elegantly written, The Widow Clicquot provides a glimpse into the life of a woman who arranged clandestine and perilous champagne deliveries to Russia one day and entertained Napoleon and Josephine Bonaparte on another. She was a daring and determined entrepreneur, a bold risk taker, and an audacious and intelligent woman who took control of her own destiny when fate left her on the brink of financial ruin. Her legacy lives on today, not simply through the famous product that still bears her name, but now through Mazzeo's finely crafted book. As much a fascinating journey through the process of making this temperamental wine as a biography of a uniquely tempered woman, The Widow Clicquot is utterly intoxicating. About the Author: Susan Ericksen is an actor and a voice-over artist. She has recorded over sixty audiobooks for such authors as Nora Roberts. Alice Hoffman. Nadine Gordimer, Stuart Woods, and Charlotte Bronte. As an actor and director, Susan has worked in theaters throughout the country. Note: This is in mp3-CD format. This signifies it will only run on CD players specifically equipped to run mp3-CDs. It also can be installed onto a home pc and copied over to numerous mp3 players and played on them.